As you have seen, more than half of all Broughams built have survived. On account of the low number built, however, ownership of a Cadillac Eldorado Brougham today is a pleasure (well, sometimes!) reserved for only a few fortunate individuals. 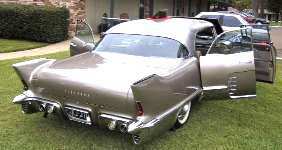 Charles D. Barnette, a member of the Cadillac-LaSalle Club, from Texarkana, Texas, is one such person. Charles wrote this interesting story about his car for the club magazine, the "Self-Starter", in 1985. It is reproduced here, courtesy of the Club. Enjoy! Small wonder that when I spotted my Brougham for the first time last August  sitting on a local car lot that I almost lost control of the car I was driving. 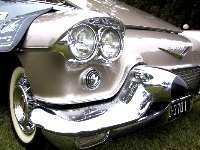 I gave up my beautiful 1957 Fleetwood for this car and garaged the Brougham next to my 1955 Cadillac series 62 sedan. 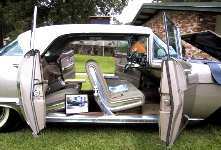 My Brougham is body No 590, engine No 58P045240, color No 148 (Kenya Beige), Trim No. 4342 (interior of beige Bayou cloth with beige leather), has mouton carpet and was shipped to the State of Missouri from the factory. 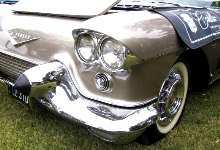 The original owner from Kansas City, Missouri, paid the staggering price of $13,197.00 in 1958 for the car. Please never lift your air suspension car with the wheels left dangling because it will drain the system immediately and never undercoat it - I learned this the hard way. These items...are the "Holy Grail" of Brougham owners and, Brougham owners, I have them all - eat your hearts out! I traced the ownership of my car back to the third owner before me and he had saved all of these items. I sometimes feel that I am behind the wheel of a vintage Corvette - the car is really more for the 'sporty minded' than the chauffeur-driven crowd. 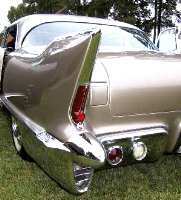 The car looks small next to my 1955 Cadillac. Remember that when cleaning or waxing the stainless steel top, use only a fore and aft motion and do not use abrasives on the surface. Also, to start the engine, both rear doors must be closed. The engine starts automatically when the key is turned to the first "right" position. The second "right" position is for use when the engine is flooded, etc. I have met through correspondence and 'phone calls the following Brougham owners who have helped me to understand this masterpiece: Anne and Andy Lambert of Wichita, Kansas, Don Fioretti from Punta Gorda, Florida and Chris Hawkins of Washington, D.C. Isn't this what the old car hobby is all about - meeting fellow enthusiasts who will share information about our pride and joys. © 1985, Charles Barnette and the Cadillac-LaSalle Club, Inc.